The author presenting at the Mekong River Commissions’s PNPCA workshop, February 2016. This article is the third in a series looking at dams in the Mekong. Part 1 can be accessed here and Part 2 here. 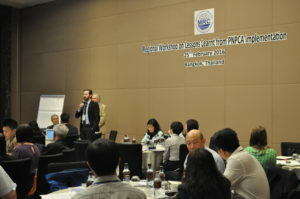 Part 2 are applied to the United Nations Convention on the Law of the Non-navigational Uses of International Watercourses (UNWC) framework operating alongside both the Agreement on the Cooperation for the Sustainable Development of the Mekong River (Mekong Agreement) and its supplementary Procedures for Notification, Prior Consultation and Agreement (PNPCA). An alternative legal framework and vision for the future of Mekong dam development is thus proposed. This three-piece article concludes with potential next steps for improved transboundary cooperation in the Mekong. This article was originally printed here on the World Water Forum website. It is reposted with permission from the author and the World Water Forum. With the ASEAN Economic Community set to launch in 2015, it’s not surprising to see a heightened level of uncertainty, concern, and even apprehension about what this enhanced sphere of regional integration will mean for Southeast Asian nations. Holding this backdrop firmly in mind, the 3rd Annual International Conference on International Relations and Development (ICIRD) recently commenced at Chulalongkorn University in Bangkok, on August 22-23, 2013. This year’s timely theme, “Beyond Borders: Building a Regional Commons in SE Asia,” showcased established voices, civil society organizations, and a new generation of scholars rising to the challenges of this historical moment. Over forty panels traversed diverse but interrelated topics from environmental justice and human rights, to sustainable economic growth.